Current EVEntS – The Female Marines Have Landed! Too Bad the Girls Can’t Help You, or for that matter, Anyone Else Either | It's the Women, Not the Men! 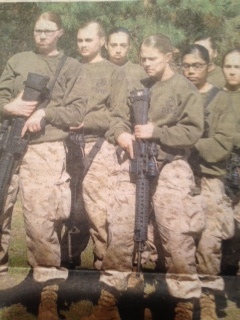 These are our future combat ready Marines! God help us. These women can’t pass the 3 pull-up requirement, they can’t shoot as well, run as fast, remain calm under fire, jump as high, climb as well, think as fast or generally fight as well as men. So, what the hell good are they? To sacrifice their lives, in time of war, while some PC female General boasts of breaking the Marine Corps’ “glass ceiling?” Sounds like Hillary Clinton and Benghazi. But, more insane is the fact that, instead of drumming the women out of the Marines for physical deficiencies, just as they would do with an unqualified man, the Marine Corps leadership is instead considering lowering the bar for women, just like the universities did, 45 years ago, when women couldn’t handle difficult math, physics, chemistry and science courses required to become a doctor, scientist or engineer. This is half the reason we have Obamacare, women don’t want to run their own practices. They like working for hospitals, corporations or large groups so they can have vacation, lunch with their friends, days off when needed, be sick or stay home with kids. Those good intentions inevitably dumb-down the system and lower the quality of the end product! When are all the good guys going to get FED UP with the delusionary world radical feminism has subjected America to, through their irrational creation called political correctness? And, when are the tough guys going to put their foot down? And, more importantly, what’s wrong with the Marine Corps “tough guys” who are in charge of the Corp? Chicken scared of girls? Or Chicken scared of Obama? Either way, it’s time to form a battalion, come out shootin” and charge the idiots head-on – before it’s too late!